As much as I respect my adult son’s abilities, I doubt that he will ever drive or raise children effectively. There is no place for him to study. He enjoys his own life and is pretty clear about his choices. I have met other autistic people like him. This raises the question of perspective and that rather fraught concept of ‘achievement’ or ‘success’. I am what you might call conventionally successful – I have a well-paid and respected profession, I have written a number of books, I own my own home, those sorts of things. For me, I live a fulfilled life, but my friend who wrote the comment has a son who is also fulfilled and happy without any of those conventional measures of success. I suspect I may need to tweak the message or at least how I deliver it. My friend with the comment was right of course. Some Autistic children will not grow into home-owning, book-writing public servants. (Actually not too many non-Autistci kids will do these things either.) Some will not fall in love or have kids, they won’t drive and they won’t live independently. I need to reconsider how I present ‘successful’ or ‘fulfilled’. Fulfilled does not have specific criteria which apply to everyone. For one person fulfilled means playing Minecraft for another it means founding Facebook. Neither of these things is better or worse than the other. For parents, you and your child have not ‘failed’ if they don’t ever get a job or drive. I think the challenge here is not to impose low expectations but also not to impose expectations which don’t actually fit with the Auitstic person. If you judged my friend’s son’s happiness and achievement by his ability to work full-time or drive a car you would have it wrong. By all means empower and encourage and have the view that your child can do all the things you might value. However, just because potentially they can doesn’t always mean they will. It is often about gaining an understanding and respect for the wishes and ambitions of your child rather than those you may place on them. This is also true for parents of non-Autistic kids. Of course this all takes us to that much-quoted adage that if you have met one Autistic person you have met one Autistic person. So to the lovely parents in my audiences, I am not saying your child has to do all the things I did to be fulfilled. What I am saying (I think) is to love and support your child whatever path they take and not to impose your own expectations and aspirations on them but instead to empower them to follow their own dreams. I am forty-one years old. I work full-time in a professional job, I own my own home, I have a Masters degree, I am financially independent, I have written three published books. So why do you suppose that people often speak to me as if I am a little girl ? 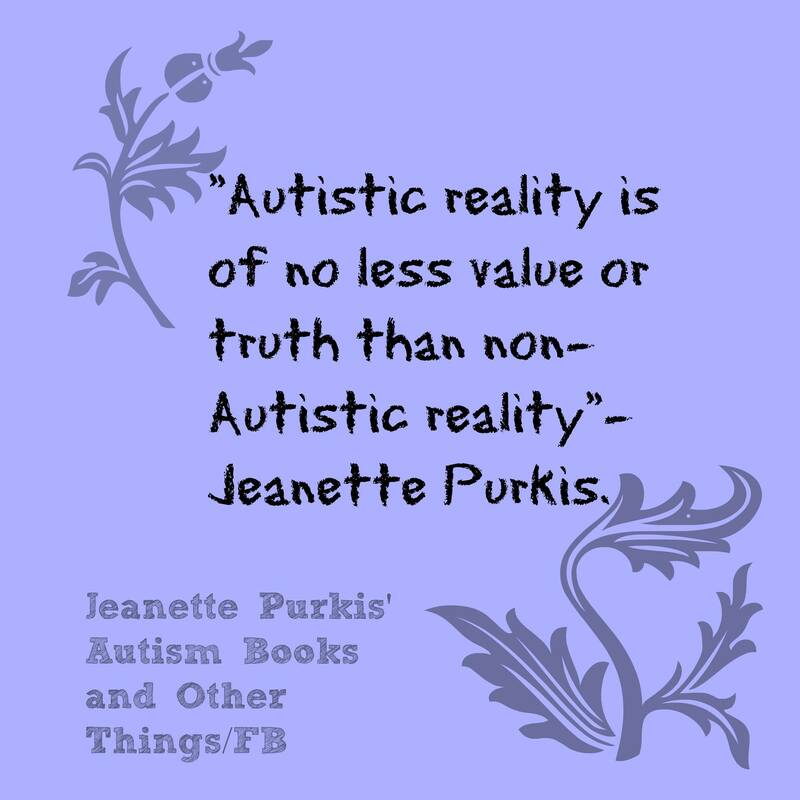 While I can’t claim to understand that I know what is gong through the minds of people who ask me if I ‘live at home with your mummy?’ or ask if I know how to order at a restaurant, I suspect it may have something to do with one of my attributes – the attribute of Autism. I am far from the only Autistic person to experience this. I think we all get it to differing degrees. Sometimes it comes from a position of concern and care and at times from derision (like the triage nurse who had a go at me for reading Harry Potter which apparently was ‘for children’ when I was in the emergency room once in 2004. At the time Harry Potter was my passionate interest and one of the few things that gave me pleasure). Autistic expression of identity can look different to its non-Auitstic counterpart. We are often interested in things non-Autistic people don’t care about and for some reason this seems to equate with us being seen as children. I like bright colours and sparkly things – I have visual processing issues which respond very badly to words on a screen but get excited by bright colours and sparkles. I wonder if this – and my open and honest presentation and easy laugh – maybe makes some people think I am less capable as an adult. I will say that they shouldn’t think that at all. Autistic adults are so often seen as innocents, as children and sexless, neuter beings. If we are lucky this means only that we miss out on meeting potential partners and if we are unlucky it can translate into abuse or violence. I know probably hundreds of people on the spectrum well enough to know that we have all the sexualities and gender identities that non-Autistic people do. I have Autistic friends who are gay, bisexual, heterosexual, asexual. I have Autistic friends who identify as transgender, pansexual, sis gender and everything in between. Personally I identify as asexual but I have had sexual experiences in the past too. I am never sure how to response to strangers who talk to me like I am a particularly unintelligent eight year-old. Sometimes I play up to it and then drop in a comment about some exceptional achievement I have had (because I am just a little bit evil!). I think this is another area which needs to be included in building Autism understanding, respect, acceptance and awareness. I say thins not only because it is frustrating for Autistic people to be treated this way and is very annoying but also because I think it may be robbing some of us of our potential. Imagine that an Autistic somebody goes to a job interview and the selection panel misinterpret their Autistic mannerisms as them begin immature or incompetent to do the job? Even if that person was the best candidate for the position they would probably not get it. This misconception of Autistic innocents and children may be robbing us of a voice in society. It may contribute to us being discriminated against as we are seen as not begin capable of managing our own destiny. There are so many domains of life which people do -Autistic and non-Autistic alike. We ARE capable and we need to change that perception around innocence. I don’t know exactly what to do to achieve that change but I have added it to ‘the list’ of things I will try to have some impact on, with my advocate and passionate colleagues. And I will be wearing my rainbow handbag and sparkly shoes and big jewellery. That does not make me a child, it makes me my happiest and favourite manifestation of Jeanette. I have not been a child for many years and I am competent and confident as a different kind of adult. Today I stood up on stage in front of 1300 people and told them a load of things from my life, all 41 years of misery and triumph, mistakes and masterpieces, loss and victory. I told them how I had been a teenage socialist, a criminal and drug addict, a homeless person with schizophrenia and a career public servant, author, autism advocate and artist. They laughed at (mostly) the right bits, they clapped – sometimes unexpectedly and I made both my mum and my dad cry (in a good way). After I had bared my soul to this multitude, they all got up and gave me a standing ovation. It was really quite amazing. 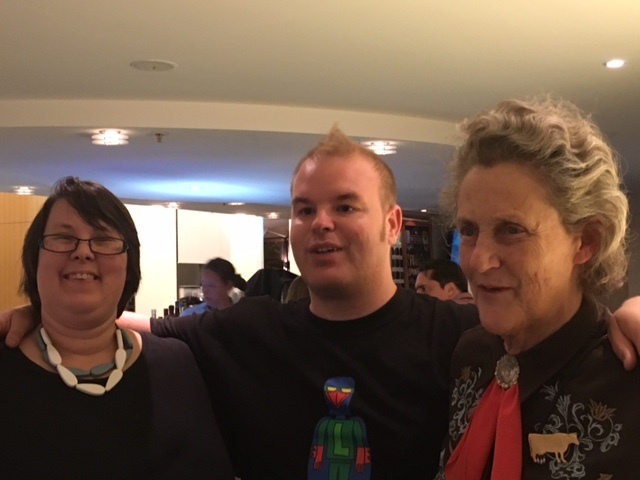 I was speaking at Irabina Autism Services’ conference alongside Temple Grandin and Tim Sharp. Add to the mix my most significant role model – both as an advocate and as a human, Professor Temple Grandin – plus a dinner with said role model, my amazing support person, coauthor and friend, Emma Goodall, my parents and amazing artist Tim Sharp and his mum, and it really was the most perfect of days. I can’t remember a better day ever, in 41 years of life. That is quite something to say about one day but it is well-deserved. In fact m talk was not just good. I think it may have been the best presentation I have ever given. About halfway through I realised that I wasn’t speaking to 1200 people, but instead that I was speaking to one entity – the audience. I was not lecturing, we were conversing. I looked out and 1200 people – my biggest live audience ever – were responding to me and giving me energy and encouragement. That is a lovely experience for any public speaker. Getting an extra 200 Facebook friends in one day! Knowing that I absolutely killed it with my presentation (in a good way). Thank you for sharing my happiness in doing this great and wonderful thing,I’m not sure if it will open any doors to anything but I don’t really care. It was the best thing I have ever done and that doesn’t really need any further actions. I probably do other things to but have forgotten them due to being so busy! I am quite accomplished to put it mildly, but the amazing thing is not that I achieved all these things but more that I believed myself capable to do so. I have Asperger syndrome and atypical schizophrenia. If those diagnostic labels were all you knew about me, I wonder what you would think me capable of? Many people might think I would be unable to work, let alone all the other things. In fact this was the case in my past. I was unable to work or participate in society in any meaningful way. I spent some years where everyone had low expectations of me. I didn’t get either of my diagnoses until I was 20. I didn’t go to school with a diagnosis and in many ways this was horrible and damaging. I had no assistance and was easy prey for every bully and bigot in the school. However I escaped one thing which plagues a lot of people on the spectrum – the curse of the low expectation. Low expectations come from every quarter in society for many children and adults on the Autism spectrum as well as those with other diagnoses. Children learn more about their limitations than their strengths a lot of the time. The tragic part of this is that it is rarely committed in malice. Rather it often happens from a place of care. Parents may shield their child from all adversity and trouble and in turn end up with an adult who has little pride in what they can do and is anxious about doing anything difficult. I do not usually place the blame with low expectations and their consequences at the feet of parents though. I think the parents are often responding to pervasive views in society which are almost unnoticed due to their prevalence. I hear it all the time. A friend told me about a kid at her child’s school who recently got an autism diagnosis and people knowing that ‘there is something wrong with him.’ Why do we equate difference and diversity with ‘wrong’? Then there was the caring if rather misguided volunteer at an Autism conference asking me ‘do you live with your mummy?’ (I am 41 and live in a house I am paying off which I bought seven years ago and am 16 years ahead with the mortgage. My ‘mummy’ can come and stay of she likes.) The people who tell me ‘surely you’re not on the Autism spectrum. You could pass for ‘normal’ and ‘your Autism can’t be very severe for you to do all the things you do’. Thankfully I never take on any limiting or doubtful comments about my capacity and neither should kids on the spectrum and their parents. Here are some quick thoughts about low expectations, with no particular order (I would usually do an order but I just got back from Board meeting and I am about to give the biggest talk in my career in five days’ time so you will understand if I am a little less effective then usual at communicating my message). There is nothing to say that a person with diagnostic labels can’t achieve anything they put their mind to – if I did others certainly can. If you have low expectations of yourself you might find working to overcome them means you have a more fulfilled and enjoyable life. Start by working on your self-talk and challenging every time you put yourself down. Also surround yourself with people who value and respect you, if you can. Find an role model you identify with. Low expectations are completely unhelpful. By challenging them – either as the ‘giver’ or the ‘receiver’ – you are doing a very good thing. In the lead up to my first ever presentation with professor Temple Grandin I chose one of my favourite Temple Grandin quotes to base this blog post on – ‘different, not less.’ This quote has resonated with me since the first time I saw it. The concept of being ‘different’ is close to many Autistic people’s hearts. I think there is a point in most of our lives where we discover that there is something called ‘normal’ and then the world we inhabit – ‘different.’ For me that moment came at age 11 when I started high school and for the first time in my life was bullied and abused and very quickly worked out that there were different groups of kids and I didn’t belong to any of them. For me this notion of ‘different’ and, more to the point, wanting not to be ‘different’, impacted hugely on my life for another 15 years. I hated my different self. If I had known how to not be different I would have jumped at the chance. Tragically I was not encouraged to be myself and to love who I am. Rather I was constantly told that my ‘different’ was weird and wrong. When I got a diagnosis of Asperger syndrome at the age of 20, I thought it confirmed my ‘different’ and I wanted nothing to do with it. The idea that there was a diagnostic label which confirmed I would never join that ‘normal’ group was like a curse. As I grew older and wiser I accepted the diagnosis and went about the business of accepting myself. Flash forward to now and I am an out loud and proud Autistic woman with a co-morbid diagnosis of atypical schizophrenia (and yes, that one took even more years of denial and angst to reach a point of acceptance). So it worked out OK for me but what about others on the spectrum? Broader society still has this notion that there is ‘normal’ and then there is ‘different’. Sadly instead of using diagnostic labels to hep people understand themselves and access appropriate services, they often just turn that person into an ‘other’ and people end up feeling bad about themselves. Bullies can use the diagnosis as a confirmation of difference and therefore inferiority (much as I felt about my own Autism diagnosis in 1994). ‘Different’ means that there are therapies and treatments designed to make Autistic kids more ‘normal” Autistic behaviours such as stimming, flapping, different styles of play or not making eye contact as seen as aberrant and ‘weird.’ In my mind this is a very unhelpful attitude and such behaviours are natural and the only issue with them is that non-Autistic people find them confronting. I was talking to a former teacher about Autistic kids. She felt the need to tell me she had taught ‘heaps of them’ and was a really good teacher. She went on to describe how she would put her finger under an eleven year-old Autistic boy’s chin and make him look at her. I resisted the urge to do this to her and see how she liked it but I was horrified. Making eye contact isn’t even a consistent need for all non-Autistic humans. For example some Indigenous Australian cultures find eye contact invasive and it is considered rude and aggressive to make eye contact. So this former teacher was basically physically manhandling a student – which I imagine he found very unpleasant at best – in order to satisfy her need for him to look at her. And not only did she think this was appropriate behaviour but she must have been pretty confident that it was a good thing because she told it to an Autism self-advocate! As Autistic people we are given all sorts of messaging which says our ‘different’ take on life is wrong, or weird or deficient. We are given low expectations on our capacity from all quarters, including for some people their own families. Many of us internalise these low expectations and prejudice and struggle to value ourselves. Many people will not tell work or university colleagues about their diagnosis, (sometimes correctly) assuming that they will be discriminated against or ridiculed. I hid my diagnosis for many years, In fact I was less ashamed that I had been in prison that I was that I was on the spectrum. Thankfully I have moved on to a better place. I love my ‘different.’ It is a great part of who I am. I sometimes find myself doing something which I realise is a bit interesting from others’ reactions and I don’t get embarrassed or care particularly. We need to build the confidence of young people and kids on the spectrum so that if others give them a hard time about their ‘different’ they will brush it off, knowing that they are amazing. I am different, not less. We are all different, not less. And what is this silly ‘norm’ that we are expected to conform to? Have a spreadsheet for EVERYTHING!! This went on until 2010. I would give a coupe of talks each year and wish fervently to be asked to do more. Something changed in 2010 though, something which was awful but actually had a lot of positives within it, even though I didn’t see it at the time.what happened was that I got really psychotic and spent the next two and a half years in and out of the psych ward, wondering if I would be able to keep my job and whether I would lose my house. I certainly didn’t spend much time thinking about fame or recognition or book contracts. 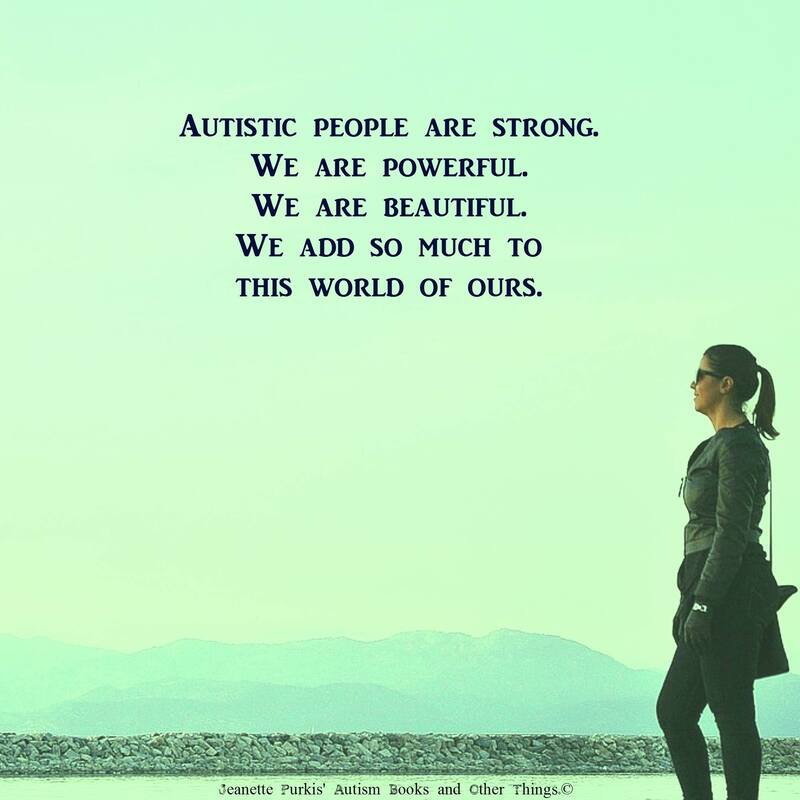 I got to a point where I genuinely stopped caring about the renown of Autism world colleagues and started to understand that they were doing good things in the world and should be appreciated and respected for that. There was not really a limited amount of opportunities or awards. And I also discovered that one doesn’t have to do everything at once. Hopefully I have a life which will last more than six months so I don’t need to cram everything in at the same time. This moment of acceptance seemed to somehow trigger off what the last two years has been about in my life – having the opportunity to speak to a wide audience about my thoughts around Autism and mental health. I got that recognition I so craved for…and I find it really tricky to manage. I am torn between feeling encouraged by all the niece feedback I get and feeling horrified to see my face in many corners of the internet. I have a saying of ‘be less famous! !’ when I come across something by me online somewhere. I am only half-joking. There is also that saying ‘be careful what you wish for’ and I am acutely aware of this. To me, a public profile can have benefits in that it allows someone to get a good message across and to connect with people and to challenge deficits-based stereotypes of people on the spectrum or those with mental illness. But there’s some negatives in there too, like people treating you like something different to your perception (e.g. ‘should I call you Miss Purkis?’ or people who dislike you aligning themselves with you in case it might be useful at some point. I often feel that I am unable to be vulnerable in case anyone feels let down by this (and OK, I know, this is rather a vulnerable blog post…) While about 99.99 per cent of people I come across are lovely and friendly and just good people, I do occasionally happen upon someone who is consumed with jealousy – like I used to be. Some fo these people are incredibly rude for no reason other than they saw me somewhere and think I’m a big snob. I’m not a big snob and I do have feelings so this is like a slap in the face and makes me sad. But it also reminds me of how I used to feel in the past so I try to move on and hope that person has the chance to get some recognition themselves if they want it. So yes, I’m a bg loud extrovert. I will take leadership when I feel the need and I am quite happy to say what is on my mind. I like the idea that lots of people get to listen to my message but I also want people to listen to other people’s good messages too. For that reason I always try to support others who are starting out on their journey – be that in public speaking or in studying or working. 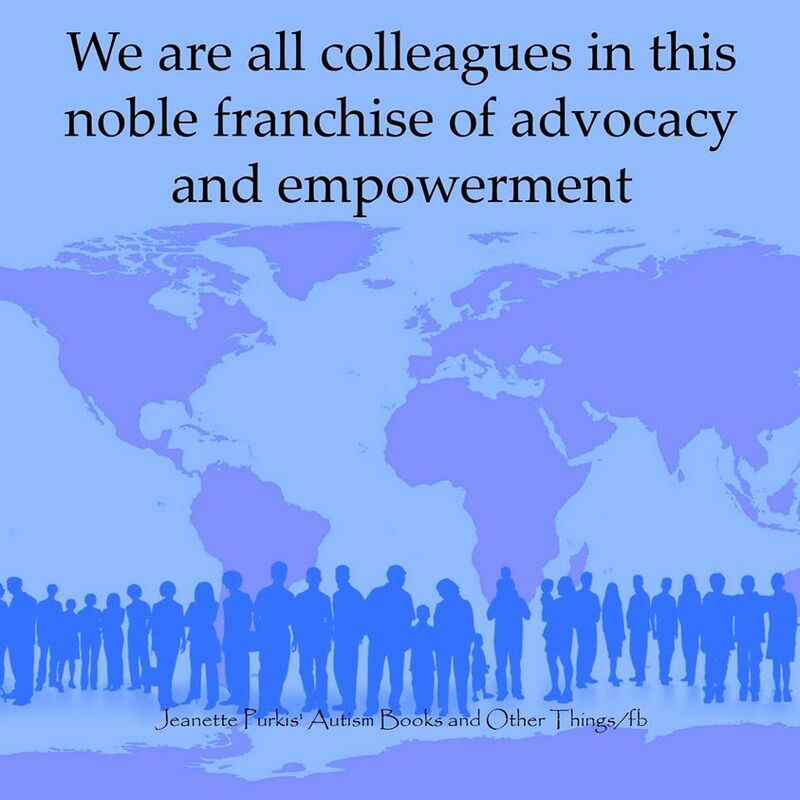 I have a meme which says ‘we are all colleagues in this noble franchise of advocacy and empowerment’ and I believe that is true. I see everyone doing similar work to me as a colleague. We are a team working for a similar outcome, not rivals or competitors.